Sour beers don’t do much for me; like most brewing fads, the majority of examples I have tasted are too over the top to be enjoyable for more than half a glass. Occasionally, something grabs my attention–for instance, I experienced a Lichtenhainer at NHC that was absolutely delicious and refreshing. More recently, fellow homebrew club member Jason brought a tasty Berliner Weisse to our club meeting. I was intrigued, but didn’t think souring was for me. I had heard that once you go down that road, you basically have to commit a set of fermentation equipment to sours (to avoid cross-contamination of non-sours). It didn’t seem worth it for a type of beers I don’t plan on brewing frequently. This all changed when I learned that Jason’s Berliner Weisse was made using a technique called kettle souring*. Basically, everything is soured before the boil–no need to contaminate carboys, hoses, or kegs! Quick, easy, and mostly painless. With some additional information in hand (both from Jason–who also gave me an extra lacto culture–as well as an online presentation via Five Blades Brewing), I set out to give souring a try. The grist for this is simple, and the techniques (outlined below) are fairly simple too. Although it’s technically a Berliner Weisse, more or less, there are enough American twists that I renamed the beer to reflect its geographic influences. Apologies to my German friends. *This is a great example of how joining a homebrew club has paid off for me; I’ve tasted all sorts of styles I wouldn’t have otherwise, and have been clued in to new techniques by my friends in the club. I probably never would have made a sour beer if not for my homebrew club! On Tuesday, October 20, I prepared a 1L starter at ~1.040 gravity (100 g of extra light DME in 1 L water), and adjusted the pH down to 4.4 using 88% lactic acid. I boiled the starter in a 2L flask, and cooled it down to 100°. Then, I added the Lactobacillus culture and let it propagate for two days. Because this was a fairly small batch, and because I wanted a quick mash with minimal equipment to clean, I followed a brew-in-a-bag protocol for the mash. On Thursday, October 22, I heated 6.85 gallons of water to 154°, and added the grains in a big bag. The mash stabilized at 150°. After 30 minutes, I added a little heat to slowly bring the temperature up to 152°, and let it ride back down slowly until 60 minutes had passed after mash-in. At this point, I raised the temperature to 168°, and let it sit for 10 minutes. In the end, I had 6.1 gallons of wort with a gravity of 1.027. This is 86% efficiency! I added ~3.3 tsp of 88% lactic acid to the wort, to bring the pH down to ~4.5. I added some ice packs to cool the wort to 95° and pitched the bacterial culture. I covered the wort with saran wrap to minimize oxygen. 12 hours later, I turned on a heat pad to help raise temperature a bit, to 85°. I let the Let sit until 2 pm on Saturday, October 24. The pH was down to 3.4 by Saturday afternoon. A thin white pellicle covered the entire surface, and the wort had a slightly cidery aroma. I took the relatively pleasant odor as a good sign. 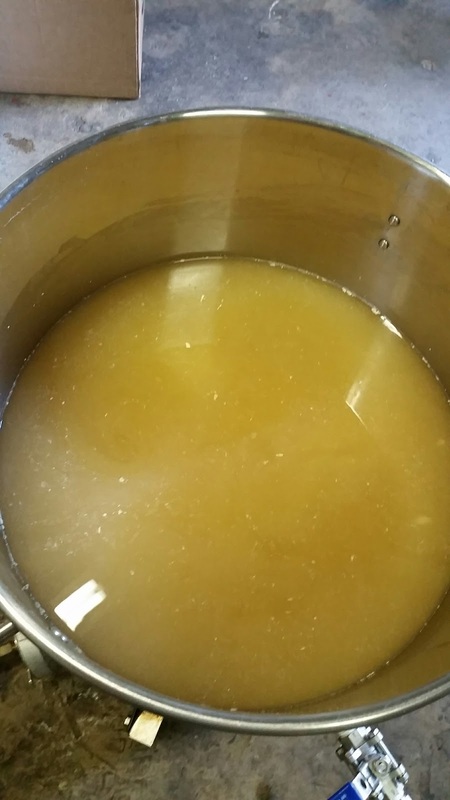 I removed as much of the pellicle as I could, and started a very hard and vigorous boil. After 40 minutes, I added the hops for 5 minutes and then removed them. After a total of 50 minutes on the boil, I turned off the flame and chilled the wort to 78°. I transferred approximately 4 gallons of wort into the fermenter and pitched the yeast. The official starting gravity is 1.032. The yeast was pitched on Saturday, October 24, 2015, and I had signs of fermentation by that evening, with a good krausen by the next afternoon. This entry was posted in BIAB, sour and tagged Claremonter Weisse. Bookmark the permalink. Like you, I have to steel myself for a sour, but I'm ready to do so when the brew is set to go!